Growing up, I wasn't fond of birds. My parents bought a parrot before I was born and he screeched louder than any sibling could have when he wanted more attention. Over the years, I grew to appreciate birds' beauty from a distance. Although I don't ever want another as a pet, I wouldn't mind owning beautiful bird jewelry. 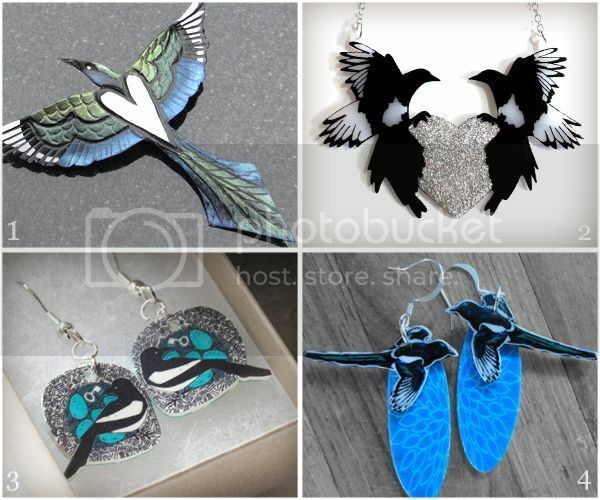 I searched Etsy for some feathered friends and found these magnificent magpie accessories. So pretty! What great finds! So many great finds, hard to pick one! Oh gosh...My parents had a parrot too! It made such a mess. I never wanted pet birds because of that parrot. That barrette is really pretty! Awesome finds.